We were trespassing. 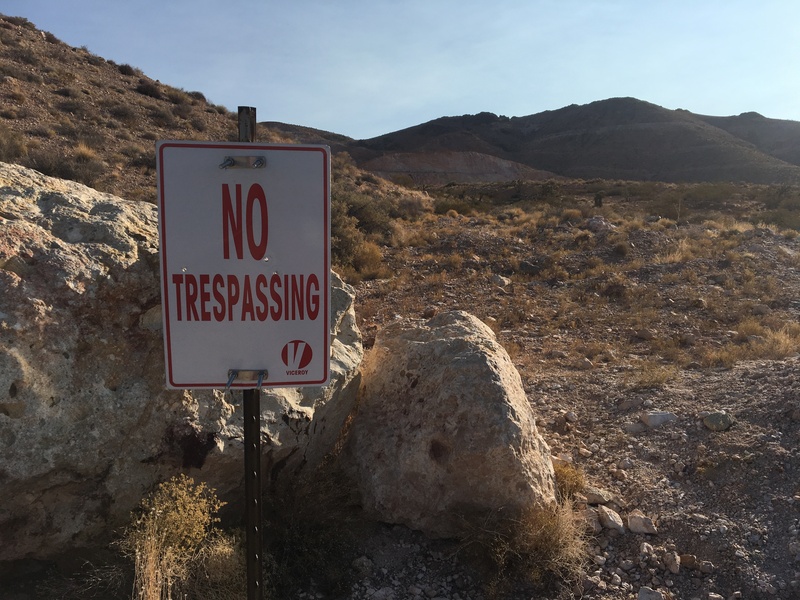 We parked the van by signs that read “Danger Open Pit” and “No Trespassing.” I could see a huge hole in the ground with pink terraced walls in a modern geometric pattern. We walked up a loose mound of mine tailings to try and get a view into the pit⁠1. At the crest of the tailings mound a bighorn sheep⁠2 with smooth curled horns glared at us then scampered off across the loose gravel. He was trespassing too. We still couldn’t see the bottom of the pit, but we could see some infrastructure across the way: a tall tower of some kind, bulldozers, trucks. I really wanted to peek into the pit, to see the bottom, so we crept closer and aimed for a service road near the edge. Jack seemed nervous but I was too excited to care⁠3. A truck moved along the opposite rim, kicking up a cloud of dust. We were close enough now to actually see people walking about. “We need to go back now,” Jack said with finality, so we turned around mere feet from a good view into the mine⁠4. 1 An open pit mine is a hole dug into the ground to extract an ore, a commonly used technique for hard metals such as copper, gold, iron, and aluminum. The pit is left open for the duration of the mine’s life. To reach the ore, large quantities of waste rock are removed and relocated, like the gravel hill we walked up. Stepped benches and access roads lead into the bottom. This particular pit was a massive gold mine. Obviously, it was dangerous. And forbidden. 2 Desert bighorn sheep populations have been on the decline since the colonization and settlement of the west. In 1998, as few as 280 bighorn were thought to reside in southern California. Since then, due to conservation efforts, the populations have grown. A herd of desert bighorn sheep is known to live in Castle Mountains, and these animals are cited as one of the resources protected in the Castle Mountain National Monument Proclamation. This was a rare and special sight. 3 I am normally an obedient rule-follower. What was driving me to take such risk? If it hadn’t been for Jack’s good sense, I would not have turned around until I gazed into the deep center of that gaping hole.